Car Story Boards: These are a few of the custom display boards I have designed for some vintage, classic, hot rod and American muscle cars. Your custom STORY BOARD or Display Board is "The FINAL TOUCH." 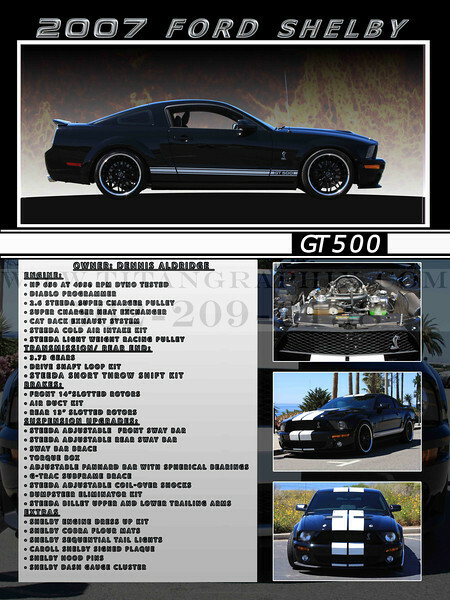 A custom STORY BOARD lets your audience know what they are looking at... Auto enthusiasts often are very interested in knowing what is under the hood, who helped with the engine, what is the specific color and which shop painted your car. There may be a unique story behind your classic car. Did you and your wife honeymoon in this car, was this your dream car back in the day, did you and your father work weekends rebuilding this car or did you buy as is and want to be able share the in workings with your friends and fellow car lovers. Each STORY BOARD is unique, customized to your liking. I come to the cars location to photograph the car in a picturesque setting. You provide the unedited copy, I have example for you if needed. At this time I will get a feel for what you are looking for in the STORY BOARD, meaning how much to focus on the engine, body, history and photos. I then get to work on the design. Once the first draft is complete I will email it to you for thoughts and comments. Once you are completely happy I will print, frame and deliver the board. The frame will have a polyurethane type of material instead of glass since will be used outside.